Tower consisted of Marian Pijnaker, Ton Hoogeboom, Cor van der Hoogt, Henk van Loon and Ben Peterzen. They released their debut album 'Titan' in 1981. The single 'See you tonight' reached number 11 in the Dutch Top 40. Their next single, 'Goin' home' peaked at number 15. Shortly afterwards, the group disbanded. Pijnaker and Van Hoogt formed a new band, Split Decision, and released one single. They then decided to go on as Tower again, but without any commercial success. 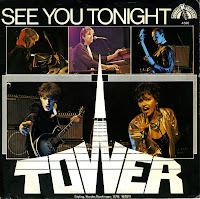 'See you tonight' is their one and only monumental piece of work. Impressive synths and powerful singing make this song a rare feat: a Dutch quality production!